After a much needed sleep-in I headed off to Union Square to get on a San Francisco city bus tour. On the shuttle bus to Fisherman’s Wharf I met an Australian couple, Steve and Dianne from Adelaide. As it was lovely, warm, sunny and clear, I set off on the Golden Gate Bridge and Sausalito tour, with a drop off at one end of the bridge so we could walk across and get collected on the other side. I didn’t prepare for the walk across the bridge, which you’re advised to take a wind and weather proof jacket with you, and Steve and Dianne offered me a spare jacket they had brought with them should I need it (not required in the end as lovely weather crossing the bridge at that time). The kindness of strangers continues and really warms my spirit. I get off the bus at Sausalito to wander on my own before heading back on a ferry. As it’s 3pm and I’ve only had a mini bagel for breakfast, lunch is required before setting off. I treated myself to lunch at Scoma’s where they catch there own fish and is right over the water looking across the bay to San Francisco. I order the Maine Lobster salad and a Chardonnay from the Napa Valley – Sonoma. The salad was delicious, with the best avocado I’ve ever had. Wine was delicious too, “buttery” as the waiter called it. As I head off to wander around Sausalito, I am in awe of the beauty of this place. I need more time to really take it all in at my leisure but I’m not even half way across when I realise I need to head back to get the ferry. I get to the wharf with 5 minutes to get my ticket and stand in the queue which is already so long I’m not sure I will get on. Luck is very much on my side though. I walk on and all the people behind me are told that they cannot take anyone else on board and will have to wait for the next one (which I think was one and 1/2 hours wait). I am known for my luck in getting car parks and winning movie tickets so I should not be surprised as my luck continues. As the ferry moves away from Sausalito and gets closer to Fisherman’s Wharf, the fog pours in covering the sea and the city. If I had stayed in Sausalito any longer my ferry ride would have been very without the views. I also get manage to get to the night bus tour just before it leaves as well. Although, it was foggy, windy and cold, I enjoyed getting shown around the city and hearing of its history. As it ends, I head back to The Grove for a late dinner. I’ve been thinking of their meatballs and the fire which I enjoy with a glass of Zinfandel. I nearly went back to my hotel room to grab my MacBook so I would fit in with the crowd but decide that my Moleskin notebook and pencil will be sufficient. 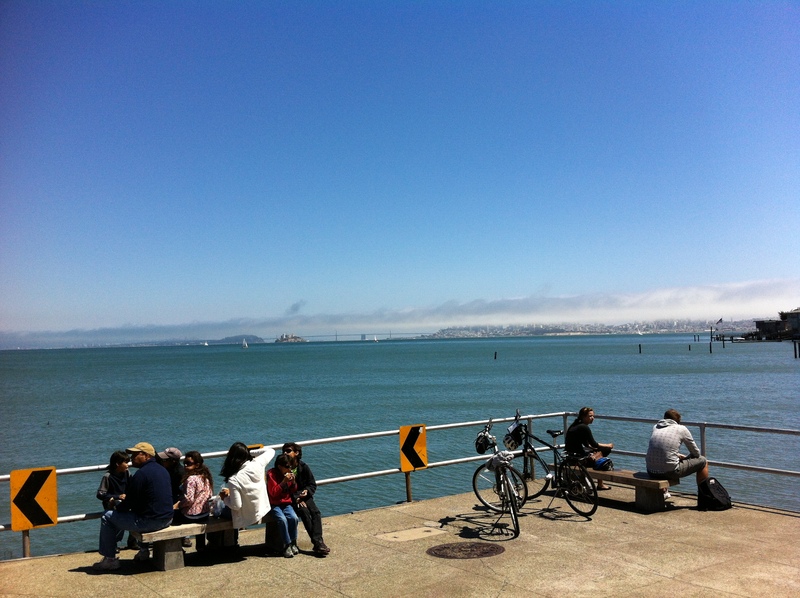 I recognise a song that is playing, “Sitting on the Dock of the Bay” written by Otis Redding when he was in Sausalito. How fitting! I’m falling in love with this city and everything in it. I have to agree on your luck with car parks etc. I hope it continues and you enjoy every minute.